The San Antonio Spurs finally found out who they will face in the NBA Finals when the Miami Heat overcame the Indiana Pacers at the end of a grueling but enthralling series that went the full distance. There is a lot on the line in this best-of-seven series, and not just the honour of becoming NBA Champions. The two teams, along the the LA Lakers, have been the mainstays of the NBA finals: since 1998 one of the three teams has been involved in each and every finals series. Both sides have won all their championships in recent memory: San Antonio has four championships from 1999, 2003, 2005 and 2007. Meanwhile Miami won in 2006 and 2012. The last time the Spurs won the title, it was when they swept LeBron James’s Cleveland Cavaliers. The Spurs version of the “big three” have won all three of their most recent titles, but, incredibly, Tim Duncan and Coach Popovich have the opportunity to win titles together fourteen years apart, testament to the longevity of either man but particularly to that of Duncan who, at 37, has managed to revive his career that seemed on the wane as recently as three years ago. Timmy has played 190 playoff games, on top of 1170 regular season games. Then, you have to remember, he also played four years in college. He averages 20 and 11 for his career, 22 and 12 in the playoffs. 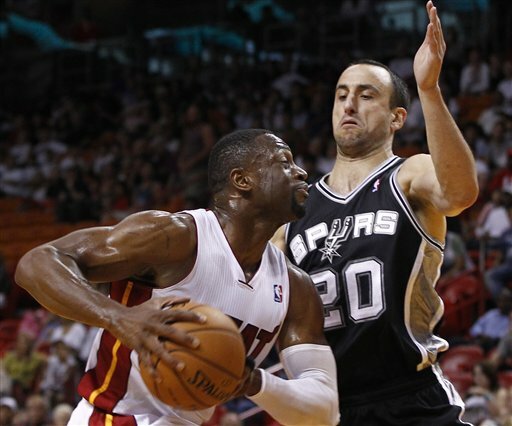 There is no doubt that the Spurs-Heat is an interesting clash of styles. Whereas Indiana have relied on their big men, much as the Spurs do with Duncan at least, Miami have no real big men. Thiago Splitter has worked his way into the San Antonio lineup to the extent that few people even remember that DeJuan Blair even exists. San Antonio has speed in the form of Tony Parker and Kawhi Leonard and then their x-factor: Manu Ginobili. It is perhaps a forgotten reality that Ginobili missed a quarter of this season through injury, such has been his return to form since his return from injury. On the other hand, the Heat have been somewhat hobbled by injuries over the past weeks. The most notable injured party has been Dwyane Wade, whose knee issues are well known and perhaps more hobbling than he would like to admit. He has been joined on the treatment table by Chris Bosh, who has hardly been in the sort of form (16 points, 7 rebounds) a game that are likely to trouble the Spurs too much, particularly as he is the biggest player on the Heat. The thing is that Chris Bosh seems to like playing against San Antonio. Bosh led a LeBron and Wade-less Heat to victory over the Spurs back in March, scoring 23 points. He’s scored 30 on San Antonio twice as a Heat player, twice more as a Raptor. Since 2010, he’s never scored less than 17 against them. Then you have the juggernaut that is LeBron James. We don’t really need to say too much more about him. He’s playing at a transcendent level. Dwyane Wade is, for me, the key to this series. If he plays like he did against Indiana in game 7, no question in my mind that Miami will win. On the other hand, if he plays like he did against Indiana in game 6, no question that San Antonio wins. First game is Thursday night at 8pm central time (that’s 2am UK time). Get the coffee on! Andrew was something of a latecomer to the game of basketball, having given up rugby after leaving high school. Joining Edinburgh’s fabled Pentland Tigers, he quickly moved on to the East Lothian Peregrines in the Scottish national league before moving to Belfast where he played with Queens and then with Belfast Star. After a year in the superleague, he moved back to Scotland and played with the Scottish Rocks in the BBL. He “retired” (the McDermott rule for using the word “retire” instead of “stopped playing” does require you to have been paid to play, so technically he retired) and moved to Seattle where he began life as an academic, which currently sees him working at University College Dublin. He is a legitimate non-frontrunning Miami Heat fan, having taken up following the team in 2001. [VIDEO] Half Court Game Winner in Cup Final!